"Today's homepage celebrates a man who filled many pages (of a different kind) with words that would forever change India's literary landscape," said the search engine. 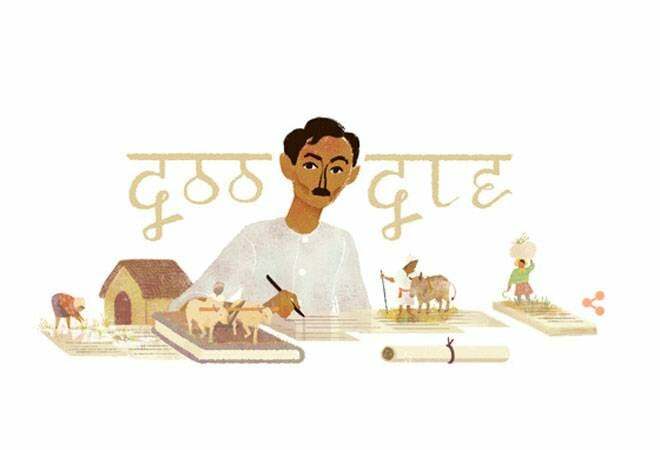 Sunday's Google Doodle pays tribute to the iconic Hindi writer Munshi Premchand's 136th birth anniversary. The doodle is inspired from Premchand's last and most popular novel, 'Godaan', which he penned in 1936. It shows the 'Upanyas Samrat' bringing his signature working-class characters to life. Born as Dhanpat Rai in a small village near Varanasi in 1880, the renowned author produced more than a dozen novels, 250 short stories, and a number of essays, many under the pen name Premchand. Initially he began writing under the pen name of Nawab Rai, he subsequently switched to Premchand. Premchand's works, Though fictional, were a reflection of the reality in society and represented the problems of the poor and the urban middle-class. Premchand was a teacher for many years until he joined the non-cooperation movement led by Mahatma Gandhi. Years later when he focused on his writings topics like corruption, child widowhood, prostitution, feudal system, poverty, colonialism and India's struggle for freedom appeared in his literature. His works were believed to be influenced by Mahatma Gandhi. Among his most popular works are Premashram(1922), Nirmala (1925), (Karmabhumi, 1931), Rangabhumi (1924) and Kafan which he penned the same year as Godaan.